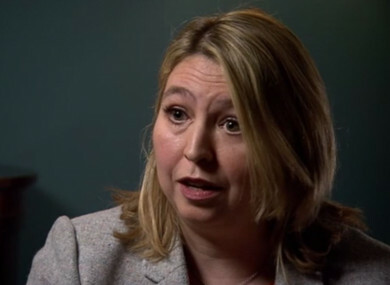 THE UK’S NORTHERN Ireland Secretary Karen Bradley has repeated her apology for saying that the deaths caused by soldiers and police during the Troubles “were not crimes” – adding that she didn’t believe what she said. Bradley has faced calls to resign over her statement in the House of Commons yesterday, where she said the deaths in Northern Ireland “that were at the hands of the military and police were not crimes”. In a statement today, she said she was “profoundly sorry for the offence and hurt” that her words had caused. I know from those families that I have met personally just how raw their pain is and I completely understand why they want to see justice properly delivered. I share that aim and that is why I launched the public consultation on addressing the legacy of the Troubles. Speaking to RTÉ News tonight, Bradley said again that she was “profoundly sorry” for the offence caused, and said she didn’t believe what she said. If I could turn the clock back to 11.45 yesterday, I would do so in a heartbeat because I never intended to cause hurt, upset or distress or to give anyone the impression that I believe what I said. It was not my belief. She said that the families and the people of Northern Ireland “need someone to deliver for them” and was “determined to deliver for them with the government”. We will deliver justice for those families. Bradley had already sought to climb down yesterday from her initial comments, later saying she hadn’t been referring to any specific cases, but was simply “expressing a general view”. In her statement today, she said the British government’s position is “clear”. We believe fundamentally in the rule of law. Where there is any evidence of wrongdoing this should be pursued without fear or favour whoever the perpetrators might be. That is the principle that underpins our approach to dealing with legacy issues and it is one from which we will not depart. She did not go as far as acknowledging that killings committed by British forces during the Troubles were crimes. As well as investigations currently under way into crimes allegedly committed by members of British security services, there have already been cases where soldiers have been convicted over killings during the Troubles. Media reports in the past week have indicated that four ex-British soldiers could be charged with the 1972 shooting of unarmed marchers in Derry on Bloody Sunday. Tánaiste Simon Coveney was asked in the Dáil today by Fianna Fáil’s Dara Calleary to address Bradley’s comments, which he himself described as “absolutely callous and completely out of order and totally inappropriate”. Calleary referenced comments made by former Foreign Secretary Boris Johnson in a column for the Telegraph newspaper at the weekend, where he said would be “a storm of utter fury” if up to four ex-British soldiers were charged with the deaths of 14 unarmed marchers in Derry on Bloody Sunday in 1972. “It’s easy to dismiss Boris Johnson, he’s paid to be bizarre,” Calleary said, adding that Bradley’s comments, however, cannot be ignored. Sinn Féin’s Pearse Doherty added that Bradley’s remarks were “outrageous and ridiculous”. He said it was important to note that her comments followed on from a statement from British Prime Minister Theresa May about protecting serving and former British soldiers who committed crimes. Doherty said the comments of both women “are an insult to families who have lost loved one to the British Army”. He said victims’ families, some of who have been campaigning for decades, deserve justice. Responding, the Tánaiste said he met with Bradley in London yesterday evening and made it clear where the Irish government stands on the issue. He said her comments caused “intense” concern, distress and hurt for families whose loved ones were killed. Coveney said Bradley’s attempt yesterday to clarify her initial comments was “important but perhaps not enough”. He noted that in her additional statement today, Bradley said she is “profoundly sorry” and “recognises the seriousness of the statement that was made yesterday”. He also said she may comment further and make contact with victims’ families when she is in Belfast later today. But he acknowledged that the timing of the comments “couldn’t be worse”, as the families of the 14 people who died as a result of Bloody Sunday await a briefing from the Public Prosecution Service for Northern Ireland next week. He also referenced last week’s decision by the UK Supreme Court that an effective investigation into Pat Finucane’s murder was not held. Finucane, a 39-year-old human rights solicitor, was shot dead by loyalists paramilitaries in front of his three children and wife Geraldine, who was also injured, on 12 February 1989. Coveney said both cases have placed a “heightened focus on legacy issues”. Taoiseach Leo Varadkar also addressed Bradley’s comments, telling reporters that he had met victims’ families in the past and that they are still grieving, still hurting and a lot of them have questions that are unanswered. He said her comments were “insensitive and they were wrong”. Bear in mind what we’re talking about here is, we’re talking about the killing of civilians, not combatants. We’re talking about peaceful protesters in Derry on Bloody Sunday, we’re talking about Ballymurphy, we’re talking about Kingsmills, we’re talking about Dublin and Monaghan. And we need a British government that is at least open to the possibility that these killings of civilians could have been crimes – and indeed there have been convictions for such killings. In that context I really think the comments were wrong and insensitive. When asked if he thought she should resign, he replied “Not going to go there”. Victims’ families and political parties in the North have led calls for Bradley to resign. John Kelly, whose brother Michael was killed on Bloody Sunday, told the BBC that her comments were “outrageous”. “Her place now is untenable, she should go,” he said. John Teggart, whose father was killed in the 1971 Ballymurphy shootings, agreed. He said: “What Karen Bradley said is that the soldiers who murdered my father – 14 bullets went through his body, ripped chunks out of his body – that soldier acted in a dignified and appropriate way. For Mrs Bradley to come out with insulting, despicable insults to families, it’s an absolute disgrace. The SDLP and Sinn Féin have also called for Bradley’s resignation. SDLP Leader Colum Eastwood said the comments were “absolutely appalling”, while Sinn Féin deputy leader Michelle O’Neill said they were “outrageous and offensive”. Email “Police-killings comments: Karen Bradley says she didn't believe what she said”. Feedback on “Police-killings comments: Karen Bradley says she didn't believe what she said”.